Liz can't help but wonder, is she doomed to a similar fate as the ancient lovers she feels so connected to? Or can she break free of the curse she has always felt trapped under and finally find peace? Naupaka Blooming is a contemporary coming-of-age love story set on the beautiful island of Oahu. If you like tropical settings, cultural exploration, a little fantasy mixed in with a little romance and compelling stories linking the past and present, then you’ll love this exotic novel from J.L. Eck. Buy your copy today! "Brilliantly crafted, this Hawaiiana tale weaving ancient lore and legend with the modern day story of a young woman discovering her authentic self is breathtaking." Kate Elliot, author of a Camino of the Soul. 4.0 out of 5 starsAn evocative read. A romance involving an Hawaiian princess, Leilani, from 1600 and a present-day accountant, Liz, who hasn't quite got her act together in that respect. But at least she's trying, even if she's not that successful in her attempts, yet, more frogs than princes appear to be around. The characters are realistic and likeable, the tenets of Buddhism that make an appearance are fascinating and the various plot threads are deftly handled. The tropical setting is beautifully described and was a wonderful backdrop to the story. A quite delightful story, the romance, mystery and the more sinister goings-on added layers and depth to what otherwise may have been a much lighter and less fulfilling read. Brilliantly crafted, this Hawaiiana tale weaving ancient lore and legend with the modern day story of a young woman discovering her authentic self is breathtaking. Rarely do I read a novel straight through. 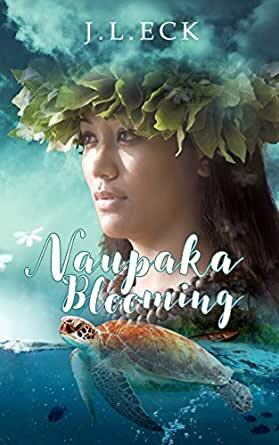 Naupaka Blooming grabbed me from the first chapter and I have spent the day totally enthralled as the past and present of the Hawaiian island of Oahu comes to life. As someone who had the joy of living on Maui for a couple of years, I can attest to the detailed descriptions and care the Ms.Eck gave in her descriptions of places and culture. All I can say now is “ When do we get Book #2”? If you love Moana or Lilo & Stitch, and would like to learn more about Polynesian culture (especially Hawaiian culture), this book is a perfect place to start. Naupaka Blooming, written by J.L. Eck, is a Hawaiian reincarnation romance story and also by far the most culturally accurate romance fiction I've ever read. The story took us back to ancient Hawaii and allowed us to get a taste of the tropical beauty through Princess Leilani's eyes. Proud and strong, she knew one day she'd be married off to a prince of another village; the thought alone annoyed her. Leilani vented her irritation by jumping off the cliff and plunging herself into the ocean. For her, the ocean gave her freedom; the ocean was her refuge. Leilani had no interests in romance until one day she met Kanoa. The day that also destined their tragic fate. Fast forward to modern day Hawaii, Liz's great grandmother, whom she'd never known, passed away and left her a house. This is the part where the author shows her true talent in writing. Woven with her accurate geographic description, Hawaiian mythology, and usage of humorous Hawaiian pidgin language, J.L. Eck allow the readers to "live" in Hawaii with her heroine, Liz. Of course, Liz's tragic and long forgotten past is promised to be compensated in the modern day. I happened to live in North Shore Oahu, Hawaii for three and half years. As I was reading Naupaka Blooming, I couldn't help but to read through the story page by page, word by word. I found myself living in Hawaii again. I knew exactly where J.L. Eck was taking the readers and she had succeeded. I was able to revisit the places I'd been missing dearly because of J.L. Eck's beautiful writing. I wonder when I can go back to Hawaii again. It'll be fun to use Naupaka Blooming as a guide to trace back to those places. Great insight into traditional Hawaiian beliefs and customs set around a story of a princess committed by her father into an arranged marriage, until the gods intercede. Switch to now and the drama moves to Liz returning to Hawaii to claim her inheritance. The story weaves loads of background information on the Island, Buddhism, Yoga, Meditation, Internet Dating and Rock Climbing ! It's well worth the read to see how Liz comes to relive her past life through reincarnation and looks again for the lost love that her Gods really blessed her with. Look out for the near death experience when Liz finds her guardian, you'd think the author had been there. Superbly described. A great relaxing read and a super way to spend an afternoon. An engaging tale that had me hooked from the start. The book opens telling the story of an ancient Hawaiian princess and her forbidden love and how both of their lives end tragically. It is the author's version of the myth of the naupaka flower. The rest of the book is about Liz and her adventures living in Paradise and discovering who she really is. Liz moved to Hawaii after she inherited her great-grandmother's house. It’s a chance to start a whole new life. She has no idea the impact Hawaii would have on her. She meets new friends, starts dating again, struggles to find the perfect job and learns new things about Hawaiian culture. But what Liz doesn’t understand are the mysterious dreams that she keeps having. What are her dreams trying to tell her? Could they be clues from a past life? After a near death experience, Liz finally gets answers to her dreams. She learns who she really is and the man she is dating is the final piece of the puzzle. I admit the cover grabbed my attention first, but the premise really made me want to read it. I love anything to do with Hawaii and it’s legends. The scenes were easy to picture with all of the descriptions. It brought back memories of my trips with the mentions of different locations. I couldn't help but be pulled towards these characters and into their lives. The writer has a way with words making this story very addictive and one that I won't forget for a long time. What a fascinating blend of past and present, love and hate, romance and tragedy! The story blends an an authoritative account of Hawaiian culture and language with well developed characters and beautifully wrought word pictures of these exotic settings. The result is marvelous experience for the reader, who will often think back to this story, and the naupaka in bloom, long after the reading is done.